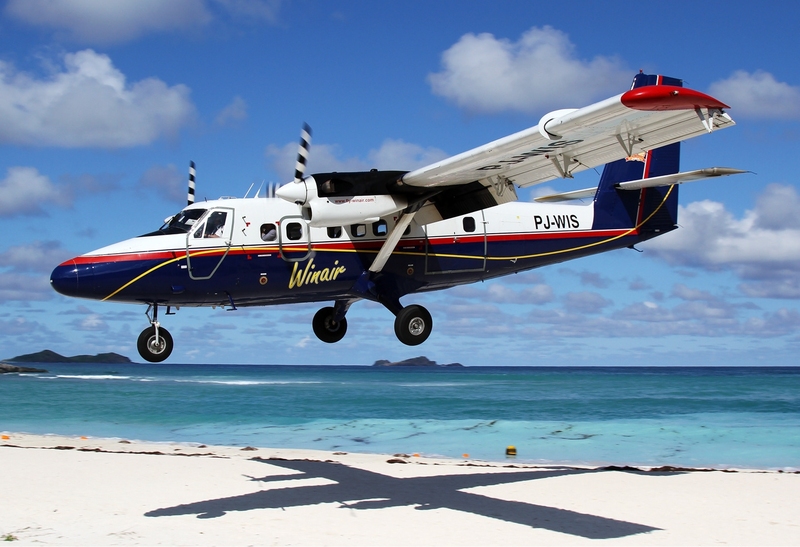 A WinAir DHC-6 Twin Otter landing at St Barthelemy Gustaf III Airport. The de Havilland Canada DHC-6 Twin Otter is a Canadian 19-passenger STOL (Short Takeoff and Landing) utility aircraft developed by de Havilland Canada and currently produced by Viking Air. The aircraft's fixed tricycle undercarriage, STOL abilities and high rate of climb have made it a successful cargo, regional passenger airliner and MEDEVAC aircraft. In addition, the Twin Otter has been popular with commercial skydiving operations, and is used by the United States Army Parachute Team and the United States Air Force's 98th Flying Training Squadron. A Twin Otter making a normal landing approach in Queensland. de Havilland Canada DHC-6 Twin Otter on Beechey Island at seamen's graves of John Franklin expedition (Nunavut, Canada) c. 1997. Note the tundra tires. Twin Otters could be delivered directly from the factory with floats, skis or tricycle landing gear fittings, making them adaptable bush planes for remote and northern areas including Canada and the United States, specifically Alaska. Many Twin Otters still serve in the far north, but they can also be found in Africa, Australia, Antarctica and other regions where bush planes are the optimum means of travel. Their versatility and maneuverability have made them popular in areas with difficult flying environments, including Papua New Guinea. In Norway, the Twin Otter paved the way for the network of short-field airports, connecting the rural areas with the larger towns with outstanding reliability, and remained in service until 2000 on certain routes. Widerøe of Norway was, at one time, the world's largest operator of Twin Otters. During one period of its tenure in Norway, the Twin Otter fleet achieved over 96,000 cycles (takeoff, flight and landing) per year. A number of commuter airlines in the United States got their start by operating Twin Otters in scheduled passenger operations. Houston Metro Airlines (which later changed its name to Metro Airlines) constructed their own STOLport airstrip with a passenger terminal and maintenance hangar in Clear Lake City, Texas near the NASA Johnson Space Center. The Clear Lake City STOLport was specifically designed for Twin Otter operations. According to the Official Airline Guide (OAG), Houston Metro operated 22 round-trip flights at one point every weekday between Clear Lake City (CLC) and Houston Intercontinental Airport (IAH, now Houston George Bush Intercontinental Airport) in a scheduled passenger airline shuttle operation. Houston Metro had agreements in place for connecting passenger feed services with Continental Airlines and Eastern Airlines at Houston Intercontinental, with this major airport having a dedicated STOL landing area at the time specifically for Twin Otter flight operations. The Clear Lake City STOLport is no longer in existence. The Walt Disney World resort in Florida was also served with scheduled airline flights operated with Twin Otter aircraft. The Walt Disney World Airport (WDS), also known as the Lake Buena Vista STOLport, was a private airfield constructed by the Walt Disney Company with Twin Otter operations in mind. In the early 1970s, Shawnee Airlines operated scheduled Twin Otter flights between the Disney resort and nearby Orlando Jetport (MCO, now Orlando International Airport). This STOL airfield is no longer in use. Another commuter airline in the U.S., Rocky Mountain Airways, operated Twin Otters from the Lake County Airport in Leadville, CO. At an elevation of 9,927 feet above mean sea level, this airport is the highest airfield in the U.S. ever to have received scheduled passenger airline service, thus demonstrating the wide ranging flight capabilities exhibited by the Twin Otter. Rocky Mountain Airways went on to become the worldwide launch customer for the larger, four-engined de Havilland Canada DHC-7 Dash 7 STOL turboprop but continued to operate the Twin Otter as well. Larger airlines in the U.S. and Canada also flew Twin Otters. Alaska Airlines, the original Frontier Airlines (1950-1986) and Wien Air Alaska were air carriers that flew Boeing 727 jetliners as well as earlier versions of the Boeing 737 jetliner at the time. All three airlines also operated Twin Otter aircraft. Ozark Airlines was primarily a Douglas DC-9 jetliner operator that also flew Twin Otters. In addition, Pacific Western Airlines (PWA) and Transair, Canadian air carriers that operated Boeing 737s, both flew Twin Otter aircraft as well. Two other Canadian airlines that flew Twin Otters, Time Air and Norcanair, also operated Fokker F28 Fellowship passenger jets. In many cases, the excellent operating economics of the Twin Otter allowed airlines large and small to provide scheduled passenger flights to communities that most likely would otherwise never have received air service. Twin Otters are also a staple of Antarctic transportation. Four Twin Otters are employed by the British Antarctic Survey on research and supply flights, and several are employed by the United States Antarctic Program via contract with Kenn Borek Air. On April 24–25, 2001, two Twin Otters performed the only winter flight to Amundsen-Scott South Pole Station to perform a medical evacuation. The Argentine Air Force has used them in Antarctica since the 1970s with at least one of them deployed the whole year at Marambio Base Chilean Air Force has operated the type from 1980, usually having an example based at Presidente Frei Antarctic base of the South Shetland islands. As of August 2006, a total of 584 Twin Otter aircraft (all variants) remain in service worldwide. Major operators include: Libyan Arab Airlines (16), Maldivian Air Taxi (22), Trans Maldivian Airways (23), Kenn Borek Air (42) and Scenic Airlines (11). Some 115 airlines operate smaller numbers of the aircraft including Yeti Airlines in Nepal, Malaysia Airlines which uses the Twin Otter exclusively for passenger and freight transportation to the Kelabit Highlands region in Sarawak, and in the United Kingdom the FlyBe franchise operator Loganair which uses the aircraft to service the island of Barra in the Hebrides islands. This scheduled service is unique as the aircraft lands on the beach and the schedule is partly influenced by the tide tables. The Twin Otter is also used for landing at the world's shortest commercial runway on the Caribbean island of Saba, Netherlands Antilles. Ontario's Ministry of Natural Resources is also a long-time operator of the Twin Otter. Transport Canada still owns three DHC-6 Twin Otter aircraft, but they now see very limited flying time, as their role in Coastal Surveillance has been assumed by a fleet of DHC-8s. The Twin Otter has been popular with commercial skydiving operations. It can carry up to 22 skydivers to over 13,500 ft (a large load compared to most other aircraft in the industry); presently, the Twin Otter is used in skydiving operations in many countries. The United States Air Force operates three Twin Otters for the United States Air Force Academy's skydiving team. On 26 April 2001, the first ever air rescue during polar winter from the South Pole occurred with a ski-equipped Twin Otter operated by Kenn Borek Air. On September 25, 2008, the Series 400 Technology Demonstrator achieved "power on" status in advance of an official rollout. First flight of the Series 400 technical demonstrator, C-FDHT, took place October 1, 2008, at Victoria Airport. Two days later, the aircraft departed Victoria for a ferry flight to Orlando, Florida, site of the 2008 National Business Aviation Association (NBAA) Conference and exhibition. The first new build Series 400 Twin Otter (SN 845) made its first flight on February 16, 2010, in Calgary, Alberta. Transport Canada presented Viking Air Limited with an amended DHC-6 Type Certificate including the Series 400 on July 21, 2010. Air Seychelles de Havilland Canada DHC-300 Twin Otter on Bird Island, Seychelles. Twin-engined STOL utility transport aircraft, powered by two 550 shp (432 kW) Pratt & Whitney Canada PT6A20 turboprop engines. Twin-engined STOL utility transport aircraft, powered by two 620 shp (462 kW) Pratt & Whitney Canada PT6A-27 turboprop engines. Six demonstrator aircraft fitted with 11 seats, wing spoilers and an anti-skid braking system. First delivered in July 2010, powered by two Pratt & Whitney Canada PT6A-34 or optional PT6A-35 Hot & High Performance engines, and available on standard landing gear, straight floats, amphibious floats, skis, wheel skis, or intermediate flotation landing gear. Twin-engined STOL utility transport, search and rescue aircraft for the Canadian Forces. Twin-engined STOL utility transport aircraft for the U.S. Army Alaska National Guard. Six built. It has been replaced by the C-23 Sherpa in US Army service. Parachute training aircraft for the United States Air Force Academy. The United States Air Force Academy's 98th Flying Training Squadron maintains three UV-18s in its inventory as freefall parachuting training aircraft, and by the Academy Parachute Team, the Wings of Blue, for year-round parachuting operations. United States Army designation for three Viking Air Series 400s ordered in 2012. Former operators are listed where possible. Varmontt Air never operated though painted aircraft at Los Cerrillos during the early 2000 years. Loganair operating a franchise from FlyBe. Northern Airways - former operator (subsequent name changes to Air North and then Brockway Air). Northern Consolidated Airlines (NCA) - former operator (acquired by Wien Air Alaska which continued to operate these DHC-6 aircraft). Royale Airlines - former operator (aircraft acquired from Metro Airlines). On March 20, 1973, a DHC-6 operated by the Saudi government crashed into a mountain in Italy, killing all 18 people on board. On June 29, 1972, Air Wisconsin Flight 671, a DHC-6-100 with eight people on board collided in mid-air over Lake Winnebago near Appleton, Wisconsin, with North Central Airlines Flight 290, a Convair 580 carrying five people. Both aircraft crashed into the lake, killing all 13 people on board. On July 11, 1972, Norwegian Air Force DHC-6-100 67-056 crashed into a mountain on Grytøya, killing all 17 people on board. The pilot was later discovered to have been drunk. December 21, 1972, an Air France DHC-6-300 crashed into the ocean en route from Guadeloupe to Princess Juliana International Airport, killing all 11 passengers on board along with both pilots. On January 18, 1978, a Frontier Airlines DHC-6-300 (N982FL) crashed during a training flight in Pueblo, Colorado killing all three crew members. On November 18, 1978, a DHC-6 flown to Guyana to rescue Americans from the Jonestown cult was shot up by cultists and abandoned on the Port Kaituma airstrip. On July 31, 1981, Panamanian Air Force DHC-6-300 FAP-205 crashed during flight, killing all seven people on board including President Omar Torrijos (see Panamanian Air Force FAP-205 crash). On February 21, 1982, Pilgrim Airlines Flight 438, a DHC-6-300 operating a schedule 2 commuter passenger flight, made an emergency landing on the northwest branch of the Scituate Reservoir near Providence, Rhode Island. One passenger was killed, eight passengers had serious injuries. On March 11, 1982, Widerøe Flight 933 crashed into the Barents Sea near Gamvik, Norway killing all 15 people on board. Despite allegations of a mid-air collision with a military aircraft, a total of four official different investigations over 25 years all concluded the cause to be severe clear-air turbulence. The incident remains highly controversial in Norway. On June 14, 1986, while on a search mission, a Canadian Armed Forces Twin Otter (Serial number cc13807), crashed in Kananaskis, Alberta, Canada, resulting in the deaths of the military crew of three and five civilian spotters of CASARA. On June 18, 1986, Grand Canyon Airlines Flight 6, a DHC-6-300, collided with a Helitech Bell 206 helicopter, resulting in the death of all 20 people on board the DHC-6 and all five people on board the helicopter. On October 28, 1989, Aloha Island Air Flight 1712 crashed in a mountain on approach to Hoolehua Airport at Molokai, Hawaii. The crash killed all 20 on board. On April 12, 1990, Widerøe Flight 839 crashed in the ocean outside Værøy, Norway due to wind, killing all five people on board. Værøy Airport was closed following the accident. On February 14, 1991, Ecuadorian Air Force DHC-6-300 FAE447 crashed into a mountain, killing the pilot and all 21 passengers on board. On April 22, 1992, a Perris Valley Aviation DHC-6-200 lost power at Perris Valley Airport in California, crashing 200 feet (61 m) past the runway, killing 14 skydivers and two crew on board; six skydivers survived. On 27 October 1993, Widerøe Flight 744, operated by a Twin Otter 300, crashed while approaching Namsos Airport, Høknesøra en route from Trondheim Airport, Værnes, killing the crew and four passengers. A total of 13 survived the crash. On 10 January 1995, Merpati Nusantara Airlines Flight 6715, a Twin Otter 300, disappeared on a scheduled flight from Bima Airport to Satartacik Airport, Ruteng, Indonesia with the loss of 4 crew and 10 passengers. It appears to have crashed in the Molo Strait in bad weather. On November 30, 1996, an Aces DHC-6-300 crashed in the cerro el Barcino mountains 8 km. from Aeropuerto Enrique Olaya Herrera in Medellin, Colombia, resulting in the death of 15 people, two crew and thirteen passengers on the ground. On 28 September 1998, a TACV de Havilland Canada DHC-6 Twin Otter 300 (registered D4-CAX) carrying Carlos Veiga, then Prime Minister of Cape Verde, 18 other passengers and three crew members capt/instructor Socorro,first officer Elianne and third cockpit crew, crash-landed at Francisco Mendes Airport (serving Praia at that time) during a landing attempt in stormy weather, in which one bodyguard of the minister was killed. Four other people were injured and the aircraft was damaged beyond repair. Upon approach following the flight from Preguiça Airport, the aircraft had been hit by a gust of wind in an instant when the pilots intended to execute a left turn, and forced down. On March 24, 2001, an Air Caraïbes DHC-6-300 crashed in the mountains near Gustaf III Airport on Saint Barthélemy in the French West Indies, resulting in the death of 17 passengers, two crew and one person on the ground. On August 9, 2007, Air Moorea Flight 1121 crashed shortly after taking off from Moorea Temae Airport in French Polynesia; the plane was bound for Tahiti. All 20 occupants, including 19 passengers and one crew member, were killed. On May 6, 2007, French Air Force DHC-6-300 742/F-RACB in support of the Multinational Force and Observers in the Sinai Peninsula crashed, killing one Canadian and eight French peacekeepers. On October 8, 2008, Yeti Airlines Flight 103, a DHC-6-300, was destroyed on landing at Lukla in Nepal; 16 passengers and two crew died in the incident, only the pilot survived. On August 2, 2009, Merpati Nusantara Airlines Flight 9760 crashed in Indonesia about 22 kilometres (14 mi) north of Oksibil. All 16 people on board were killed. On August 11, 2009, Airlines PNG Flight 4684 crashed whilst en route from Port Moresby to Kokoda in Papua New Guinea, killing all 13 on board. On December 15, 2010, a Tara Air DHC-6-310 crashed in in the Bilandu Forest in Nepal. All 22 passengers and crew on board were killed. On January 20, 2011, a Twin Otter Crashed in Ecuador. Six military passengers died. On August 24, 2011, MASwings Flight 3516, a DHC-6 Twin Otter 310 (9M-MDM), operating from Miri to Lawas crashed 5 meters short off the river at the end of the Lawas Airport runway; however, all 18 persons on board the aircraft survived, with no serious injuries. On September 22, 2011, an Arctic Sunwest Charters DHC-6-300 float plane crashed in Yellowknife, Northwest Territories, clipping a condominium and crashing in the street killing two and injuring seven. On 23 January 2013, C-GKBC (c/n:650), a Kenn Borek Air DHC-6 Twin Otter 300 skiplane went missing over the Queen Alexandra Range in Antarctica. On board the plane were 3 Canadians. The plane had been en route from the South Pole to Terra Nova Bay. Wreckage was found on Mount Elizabeth on the 25th, the crash was said to be unsurvivable. On 16 May 2013, Nepal Airlines Flight 555 from Pokhara (PKR) to Jomsom (JMO) veered left off of the runway after touching down at Jomsom and went down the slope to the Kaligandaki river. The aircraft stopped at the bank of the river, with the left wing in the water. Three crew and four passengers received serious injuries, and 15 passengers received minor or no injuries. The aircraft was damaged beyond repair. On 10 October 2013, MASwings Flight 3002, a DHC-6-310 (9M-MDM), crashed on landing at Kudat Airport; killing two of 16 on board. ↑ "Viking Acquires De Havilland Type Certificates." aiabc.com, February 24, 2006. Retrieved: May 15, 2010. ↑ "Viking restarts Twin Otter production." flightglobal.com, April 2, 2007. Retrieved: May 15, 2010. ↑ Sarsfield, Kate. "Viking Twin Otter Series 400 certification approaches." Flightglobal', February 3, 2010. Retrieved: May 15, 2010. ↑ 5.0 5.1 5.2 5.3 5.4 5.5 5.6 "News releases." Viking Air. Retrieved: May 15, 2010. ↑ "Twin Otter - Zimex Aviation." zimex.ch. Retrieved: May 15, 2010. ↑ Jang, Brent (2010-05-14). "The rebirth of a Canadian icon.". The Globe and Mail. http://www.theglobeandmail.com/report-on-business/careers/the-rebirth-of-a-canadian-icon/article4319246. Retrieved 2012-08-08. ↑ Phelps, Mark. "Updated Twin Otter Takes Off." flyingmag.com, October 16, 2008. Retrieved: May 15, 2010. ↑ "New Country Opens up for DHC-6 Twin Otter Series 400." afhra.af.mil, July 24, 2008. Retrieved: May 15, 2010. ↑ "Viking Lands Three Orders for New Twin Otter Series 400 Aircraft from U.S. Army." vikingair.com, March 18, 2008. Retrieved: May 15, 2010. ↑ "Vietnamese Navy Orders DHC-6 Twin-Otter 400s." Defence Industry Daily, May 5, 2010. Retrieved October 10, 2011. ↑ "NSF PR 01-29 — Civilian Aircraft to Evacuate South Pole Patient." nsf.gov. Retrieved: May 15, 2010. ↑ "2001—Doctor Evacuated from the South Pole." www.70south.com. Retrieved: May 15, 2010. ↑ Williams, Jeff. "Pilot says pole flight wasn't his most challenging." usatoday.com. ↑ "Pilots return after historic South Pole rescue." cbc.ca/news. Retrieved: May 15, 2010. ↑ "Aircraft in Antarctica: British Antarctic Survey." antarctica.ac.uk. Retrieved: December 31, 2007. ↑ "Official picture." fuerzaaerea.mil. Retrieved: May 15, 2010. ↑ Hulcazuk, Sergio. "Twin Otter: El castor patagonico." aeroespacio.com. Retrieved: May 15, 2010. ↑ "Fleet." Kenn Borek Air. Retrieved: June 29, 2011. ↑ "Skydive Orange Capacity and Altitude." skydiveorange.com. Retrieved: October 19, 2008. ↑ Bob Antol (April 2001). "The Rescue of Dr. Ron Shemenski from the South Pole". Bob Antol's Polar Journals. http://www.stargate4173.com/Polar/PolarJournals/southPoleRescue.html. Retrieved 2013-01-23. ↑ "Doctor rescued from Antarctica safely in Chile". New Zealand Herald. 27 April 2001. http://www.nzherald.co.nz/world/news/article.cfm?c_id=2&objectid=185352. Retrieved 2013-01-23. ↑ TRANSCRIPT (26 April 2001). "Plane With Dr. Shemenski Arrives in Chile". CNN. http://edition.cnn.com/TRANSCRIPTS/0104/26/bn.02.html. Retrieved 23 January 2013. ↑ "Viking Twin Otter Series 400 Achieves Power On." vikingair.com, September 25, 2008. Retrieved: May 15, 2010. ↑ "Twin Otter Shakes Its Wings Over Victoria Skies." canada.com, October 2, 2008. Retrieved: May 15, 2010. ↑ "First Flight For New Twin Otter A "Boring" Success." canada.com, October 1, 2008. Retrieved: May 15, 2010. ↑ Padfield, R. Randall and Matt Thurber. "Revived Twin Otter Makes First Flight." ainonline.com, October 8, 2008. Retrieved: May 15, 2010. ↑ "Twin Otter Series 400 completes maiden sortie." flightglobal.com, February 17, 2010. Retrieved: May 15, 2010. ↑ "94 FTS Fact Sheet." afhra.af.mil. Retrieved: August 12, 2009. ↑ "UV-18." globalsecurity.org. Retrieved: August 12, 2009. ↑ "Sander Geophysics Acquires Twin Otter Survey Aircraft." Sander Geophysics, July 13, 2010. Retrieved: June 23, 2010. ↑ "Our Plane." Skykef, 2010. Retrieved: September 27, 2010. ↑ The Israeli aviation history site, 2012. (Hebrew). ↑ "Vietnamese Navy Orders DHC-6 Twin-Otter 400s." Defense Industry Daily, 2010. Retrieved: May 15, 2010. ↑ National "Aircraft Accident Report North Central Airlines, Inc., Allison Convair 340/440 (CV-580), N90858, and Air Wisconsin, Inc., DHC-6, N4043B, Near Appleton, Wisconsin, June 29, 1972, adopted April 25, 1973." Transportation Safety Board Report Number NTSB-AAR-73-09. Retrieved: November 18, 2011. ↑ "Deaths in the Family." Frontier Airlines Deaths. Retrieved: August 24, 2010. ↑ "24 years after the accident." Prensa. Retrieved: March 5, 2005. ↑ NTSB Aircraft Accident Report NTSB, January 3, 1990. ↑ "Perris Valley Aviation Services DHC-6." NTSB, February 17, 1994. Retrieved: August 27, 2013. ↑ Ranter, Harro and Fabian I. Lujan. "ASN Aircraft accident de Havilland Canada DHC-6 Twin Otter 300 PK-NUK Molo Strait." Aviation Safety Network, 2011. Retrieved: June 27, 2011. ↑ "Accident survenu le 24 mars 2001 sur l’île de Saint-Barthélemy (971) au DHC-6-300 « Twin-Otter » immatriculé F-OGES exploité par Caraïbes Air Transpor" (in French). Bureau d'Enquêtes et d'Analyses pour la Sécurité de l'Aviation Civile, October 7, 2001. ↑ Clark, Amy S. "20 Thought Dead In Pacific Plane Crash." CBS News, August 9, 2007. ↑ "Accident description: L'Armée de L'Air 742/CB." Aviation Safety Network. Retrieved: December 15, 2009. ↑ "Crash." BBC News. Retrieved: October 8, 2008. ↑ Hradecky, Simon. "Crash: Merpati DHC6 aircraft impacted mountain." Aviation Herald, October 16, 2009. Retrieved: May 15, 2010. ↑ "Mixed weather reported before PNG plane crashed." The Australian, August 2, 2009. Retrieved: May 15, 2010. ↑ , Shrestha, Manesh. "22 dead in Nepal plane crash." CNN, December 15, 2010. Retrieved: February 2, 2012. ↑ "Honores de la FAE para seis víctimas de accidente" (in Portuguese). eluniverso.com, January 20, 2011. Retrieved: February 2, 2012. ↑ "Yellowknife plane crash kills 2 people." CBC, September 22, 2011. Retrieved: February 2, 2012. ↑ "23 JAN 2013". Aviation Safety Network. 24 January 2013. http://aviation-safety.net/database/record.php?id=20130123-0. Retrieved 25 January 2013. ↑ (French) Radio-Canada (23 January 2013). "Un avion transportant trois Canadiens est disparu en Antarctique". Station Radio-Canada. http://www.radio-canada.ca/nouvelles/International/2013/01/23/006-antarctique-avion-disparu.shtml. Retrieved 23 January 2013. ↑ CTV News (23 January 2013). "Kenn Borek plane carrying three Canadians missing in Antarctica". CTV. http://calgary.ctvnews.ca/kenn-borek-plane-carrying-three-canadians-missing-in-antarctica-1.1126655. Retrieved 23 January 2013. ↑ CTV News (26 January 2013). "Wreckage of missing plane found, crash deemed 'not survivable'". CTV News. http://www.ctvnews.ca/world/wreckage-of-missing-plane-found-crash-deemed-not-survivable-1.1130533. Retrieved 26 January 2013. ↑ "Accident: Nepal DHC6 at Jomsom on May 16th 2013, runway excursion". AVHerald. 16 May 2013. http://avherald.com/h?article=46259f57&opt=0. Retrieved 16 May 2013. ↑ "Twin Otter Series 400." Viking. Retrieved: June 16, 2012. Rossiter, Sean. 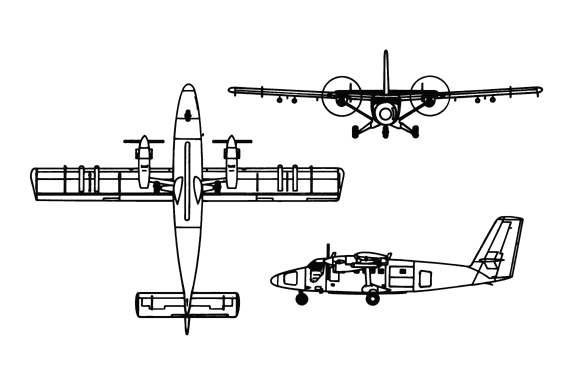 Otter & Twin Otter: The Universal Airplanes. Vancouver: Douglas & McIntyre, 1998. ISBN 1-55054-637-6. Wikimedia Commons has media related to DHC-6 Twin Otter.